We love our shipper Daryl so much that when he came to us asking for a couple months off this Summer to go back to Flannelville, Saskatchewan to help on the family farm, well of course we let him go. We paid for his train tickets (Daryl doesn’t fly), gave him a whack of pocket money and dropped him at the train station. Momma BladeTape even made him his favourite sandwiches for the trip—Baloney, Pickles and Ketchup on hot dog buns. Daryl’s been back about 3 weeks now, and it appears the beauty of the fields of their special Canola/Hemp hybrid on the family farm made Daryl feel a little artistic. Mixing together some black and some white rubber to make a funky look, the result was what we are calling #DarylTape. DarylTape still gives you the same great Puck Control and Performance of regular Black or White BladeTape, it just looks a little different. No two sets are exactly alike, and there are only so many of them. It’s not White, it’s not black. It is funky and different, just like our Daryl. We decided we would offer #DarylTape up on a first come, first serve basis to our regular BladeTape supporters and offer them a great savings on this unique product. There are less than 200 sets available. As for Daryl, he’s nervous we’re going to fire him*. (We would never fire Daryl, but don’t tell him that, we’re having some fun with this.) 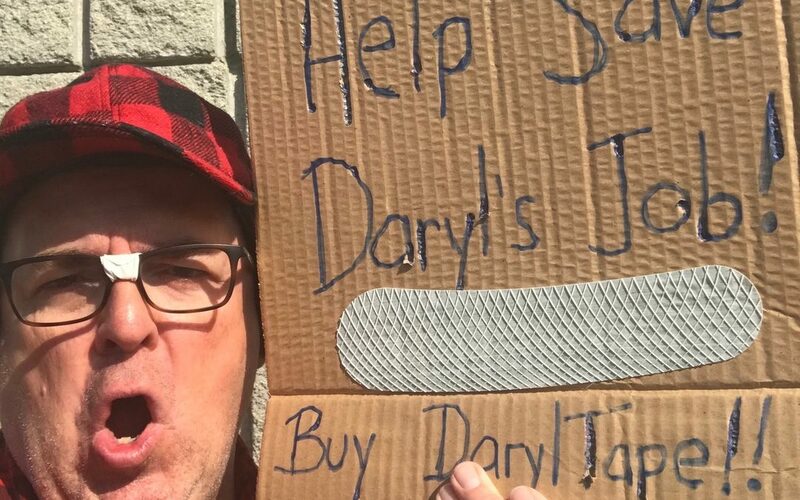 We’ve told him if he can sell off all the #DarylTape over the next 3 weeks, he’ll have a job here through the winter and won’t have to up and move back to ride out the winter in Flannelville, SK in his converted ice-fishing hut beside the pig barn on the family farm. So, it’s up to you BladeTape Nation. Jump on this great deal on #DarylTape and place your orders now. Daryl’s future as a BladeTape Engineer and Super-Shipper depends on it!*….. *Daryl’s future at BladeTape doesn’t really depend on it, but it does sound dramatic, doesn’t it? 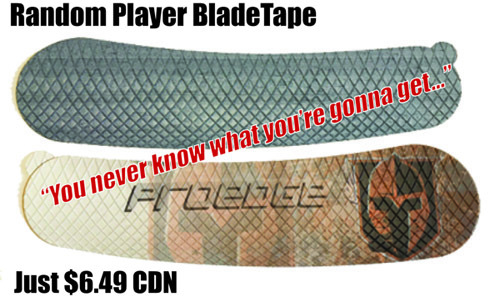 DarylTape: Buy Now, #SaveDaryl – and save some dough!